I remember very well years ago when I was switching to green beauty products, I bought my first natural sunscreens – organic sunscreens from Green People. That time Green People’s sunscreens were slightly different – the maximum SPF they offered was 25 and I think their formulas were slightly different too. Along with their SPF25 sunscreen I also bought their SPF15 Sun Lotion (with tan accelerator) which they still offer today. Since those early days, I’ve tried many other natural sunscreens and I can now easily say that sun creams from Green People are definitely one of the best. So I decided to revisit them this year and wrote about them in more detail on my blog. If you are looking for that perfect organic and natural sun cream you should really consider Green People as their organic sunscreens did not only earn some great awards, but they are also really popular among green beauty bloggers who highly praise them. First on the list is Green People SPF30 Sun Lotion which is a scent-free sunscreen with 84% organic ingredients. This is the highest SPF30 that is offered by Green People and sometimes I wish they would offer a higher SPF but it’s worth noting that there is not much difference between SPF30 and SPF50 – SPF50 offers only 1% more sun protection than SPF30. 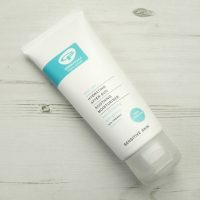 This sun lotion from Green People is perfect for sensitive skin and those prone to eczema and prickly heat. It contains natural antioxidants which come from aloe vera, green tea and edelweiss – these protect your skin against cell damage and can prevent premature ageing. Moisturising aloe vera will also help to prevent skin dryness and treat any already existing dry patches. Edelweiss is an Alpine plant which is a rather special ingredient – Edelweiss extracts are naturally high in flavonoids and phenolic acid that aid to fight UV-induced damage. To get 15% off Green People SPF30 Sun Lotion use the code HEALTHY15, FREE UK delivery. Green People SPF30 Sun Lotion does not contain any potentially harmful ingredients such as SLS, SLES, methylisothiazolinone (MI), methylchloroisothiazolinone (MCI), parabens, lanolin, phthalates, propylene glycol, alcohol (ethyl alcohol, ethanol), irritating emulsifiers, synthetic fragrance, gluten, colourants, petrochemicals, urea, DEA, TEA or PEGs. All studies show that when combined with creams or lotions which contain emulsifiers or binding agents, nanoparticles not only retain their UV light-absorbing capacity, but they ‘clump’ together. This creates much larger, extremely stable molecules that are far too large to penetrate the skin – think of it like trying to fit a football in a snooker pocket! As a result of this discovery, Ecocert has approved the use of nanoparticles as a sun-filter in certified organic products at a concentration of up to a 25%. To learn more about their reasoning and why they think there is no reason for concern, check out this page. To get 15% off Green People SPF30 Sun Lotion just use the code HEALTHY15, FREE UK delivery. 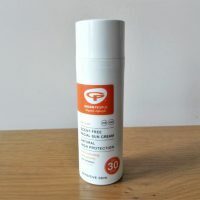 The SPF30 Sun Lotion from Green People is cruelty-free and suitable for vegetarians, but not vegans (it contains beeswax). I found this sunscreen easy enough to apply and it’s great that it’s not greasy as some other natural sunscreens. When massaged well into the skin you won’t be left with any whiteness which is another positive. There is no doubt this is a great natural sunscreen, great for your summer holiday. I would just say that if you use it when you are doing outdoor sports such as hiking or cycling, you will find your skin gets a bit wet on the surface – this happens only when you are active and start to sweat. This is the only thing I don’t like about this sunscreen but I still feel it gives me great sun protection as I never burn when using it. We do not use the ‘star rating’ system as this is now owned by Boots the Chemist, who licence other companies to use it. The ‘star-rating’ system is not the only way to tell if a product offers protection against UVA rays. The European Cosmetics Association COLIPA have designed a symbol to indicate whether products offer UVA protection in line with the Recommendations of the European Commission. The recommendations of the European Commission states that, the claimed UVA protection factor should be 1/3 of the claimed SPF number, Green People Sun Lotions exceed this. This symbol, which consists of the letters UVA inside a circle, is used by Green People to confirm that our products offer UVA protection in line with these recommendations. All of our sun lotions offer Broad Spectrum Protection (both UVA & UVB). When applying any sunscreen you need to make sure you apply enough. It’s recommended to use at least six full teaspoons to cover the body of an average adult. The sunscreens from Green People are not effective as soon as you apply them. You should apply them to your body at least 20 minutes before sun exposure. After that, you should re-apply every 2 hours or after swimming. Just keep in mind that also if you are wearing sunscreen, you should try not to stay too long in the sun and the recommendation is to avoid the strongest sun which is between 11am and 3pm. The SPF15 Sun Lotion from Green People with natural Tan Accelerator is a sunscreen which my partner loves very much. He thinks it’s the best natural sunscreen ever (he tested many natural sunscreens before). He loves that it doesn’t leave any whiteness behind but even more that it accelerates the tanning process. I personally prefer using higher SPF in hot climates but I am happy to use this in the UK. Trials on human volunteers have shown that the speed of tanning increases by over 24% compared to placebo, the intensity or depth of suntan increases by over 28%, and when used after obtaining a tan, reduces the tan-fading rate by almost 50%. The tan obtained through the use of Inositol is a true tan while still giving good protection against both UVA and UVB rays. The Green People Sun Lotion SPF15 is cruelty-free and suitable for vegans. To get 15% off Green People SPF15 Sun Lotion use the code HEALTHY15, FREE UK delivery. The percentage of organic ingredients in this sunscreen is slightly higher – 87% – compared to their SPF30 version which is 84%. Here I also wanted to mention that Green People do not use ingredients which are harmful to marine life. They do not use Zinc Oxide which is harmful to aquatic life and instead, they use marine-friendly Titanium Dioxide and other approved sun filters instead. Green People also offer natural sunscreen designed especially for children. This sunscreen has an SPF30 and contains 78% organic ingredients which is much less than the other two organic sunscreens. But the formula must have been changed as on their website the picture of a product shows 84% organic ingredients (the sample I have it’s definitely 78% organic). This sun lotion for children actually won a Mama & Baby award from the Beauty Shortlist this year which is really good as you then know it must be a good product. It’s even recommended on Vogue.com. To get 15% off Organic Children Sun Lotion SPF30 just use the code HEALTHY15, FREE UK delivery. Organic Children Sun Lotion SPF30 offers 97% UVB protection (the rays that cause burning) and it’s moisturising, soothing and non-greasy. It contains the same ingredients found in other sunscreens from Green People: Organic Aloe Vera, Green Tea & Edelweiss. The difference between the children’s sun lotion from Green People and the adult one is very subtle – they have a very similar formula and both are suitable for children and adult skin. But according to Green People, “the formula of the adult sun lotion contains slightly richer base oils so may need a little more rubbing in on a child whereas the children’s sun lotion is a light base formula”. 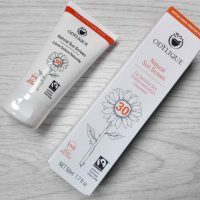 Organic Children Sun Lotion can be used all over the body, including the face and can be used during pregnancy as well (although the adult lotion is good for that too). It can even be used on babies less than 4-month-old although it’s always recommended to keep them out of the sun as much as possible. Finally, I also wanted to mention an organic sun cream from Green People which has been created especially for the face. I haven’t been using it this year but I have tested this in the past and you can read my full review here. In summary, the SPF30 Facial Sun Cream from Green People offers good sun protection and when using it I’ve never been sunburnt. It’s non-greasy and does not cause any breakouts (does not clog the pores). It’s made with 78% organic ingredients, containing the standard Organic Aloe Vera, Green Tea & Edelweiss. It’s quite nourishing on its own so you may not need to apply your moisturiser underneath. The texture is slightly thicker compared to other organic sunscreens from Green People. To get 15% off Green People Facial Sun Cream, just use the code HEALTHY15, FREE UK delivery. This sun cream is scent-free which is great for sensitive skin and you can even use it around your eye area (there is no alcohol in this product so it’s not going to irritate your eyes). It can be used by both men and women. And if you need an after-sun body moisturiser, I’ve tried Green People Hydrating After Sun Moisturiser as well which is light and non-greasy. It has a gentle cooling effect (due to peppermint oil) and it also has soothing properties as it has an addition of Chamomile and Calendula. This after-sun moisturiser is not only for summer though, it can be used all year round as a cool, fresh body lotion. All in all, organic sunscreens from Green People are great and I am happy to recommend them. They offer good sun protection and by using them you can rest assured you won’t burn in the sun (as long as you apply enough and use them as recommended). Unfortunately, they are not vegan (apart from the SPF15 sun lotion) which may be disappointing for some. But they are cruelty-free and have no ingredients that would harm marine life. If you are looking for a good natural sunscreen with a high percentage of organic ingredients, sunscreens from Green People are definitely worth considering. These sunscreens come in different sizes so to start with you can get yourself travel sizes first (100ml) although for a long family holiday you will definitely need at least 200ml. Remember, you can get a 15% discount if you use the code HEALTHY15, just make sure you click on this link to ensure the discount code works. Disclaimer: This post contains affiliate links which means that I may get rewarded a commission if you purchase a product after clicking on a link. This does not cost you anything.